When you have a handyman at your home that you like and trust, one that does great work, you want those talented folks to take care of more for you. That’s why we, at Archadeck of Charlotte, started our remodeler and handyman division – Value Remodelers & Handyman Service. We were often asked if we could fix a window, paint a nearby section of the home, add some tile to an inside room because our customers saw our skills in taking care of these on the outside of their home. Now, not only our outdoor clients utilize our service, customers from all over the Charlotte metro use our service for all their handyman needs including kitchen remodeling, bathroom remodeling, Charlotte small bathroom remodeling, Charlotte shower remodeling, and a comprehensive set of handyman services. 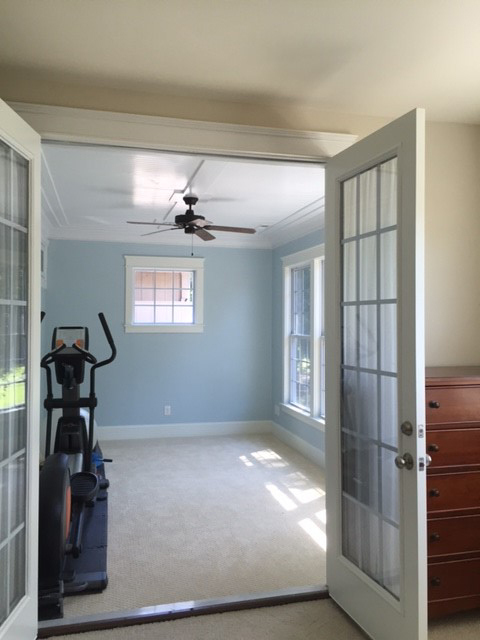 Our services also include room additions like the one you see above in Waxhaw NC. Imaging luxuriating in the bath above. This Charlotte bathroom remodel came complete with replacing the old traditional tub with a freestanding tub along with richly colored tile replacement. The use of mirrors make the room larger. Finishing the column with a grand column style makes these Charlotte homeowners feel their personal bathroom is part of a luxury resort. Tile. Stunning tile. Gorgeous tile. Mosaic! There’s nothing like a custom tile design for your new Charlotte bathroom. Take a look at the way this mosaic was woven to complete the new shower area and the rest of the bathroom. And take a look at that shower! There’s a reason we Charlotteans love frameless showers. No more murky plastic shower walls that are a magnet for haze and mildew. Frameless glass shower walls come pre-treated to keep your doors from hazing. Water rolls off and mildew doesn’t build up. The perfect solution for this perfect bathroom remodel. Speaking of fabulous tiling for your Charlotte area bathroom, take a look at this shower with frameless glass door. 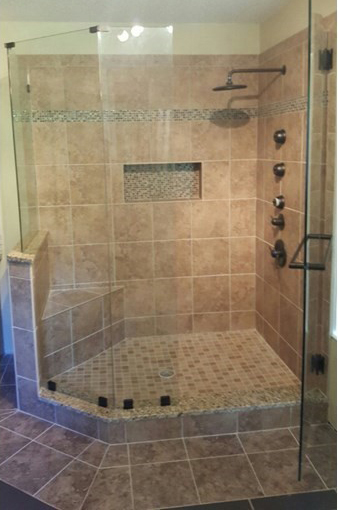 This family wanted custom tiling detail throughout their new large shower and that’s what they received. The dark colored fixtures they selected were the perfect finishing touch on this space. Is your kitchen ready to be redone? The good news is you don’t have to scrap everything with your kitchen to have a great new look. 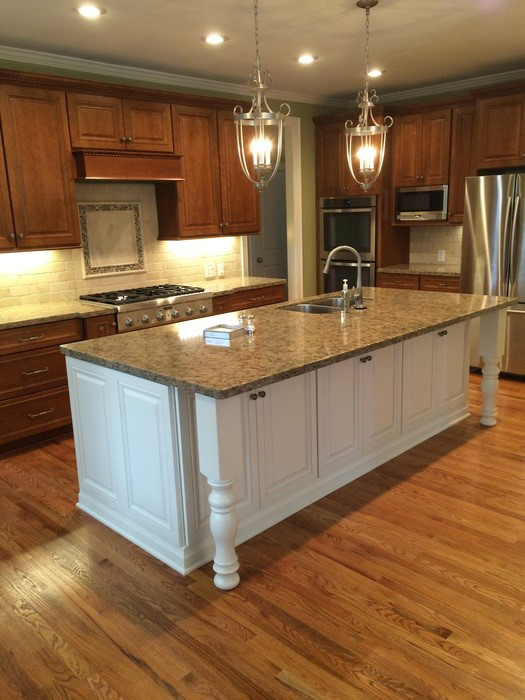 We can update your countertops to granite, reface your cabines, change out your flooring to hardwood and add custom details to make it look not only brand new, but look like it’s from the pages of an upscale home magazine. What makes for the perfect kitchen color pallet? That’s completely up to you. 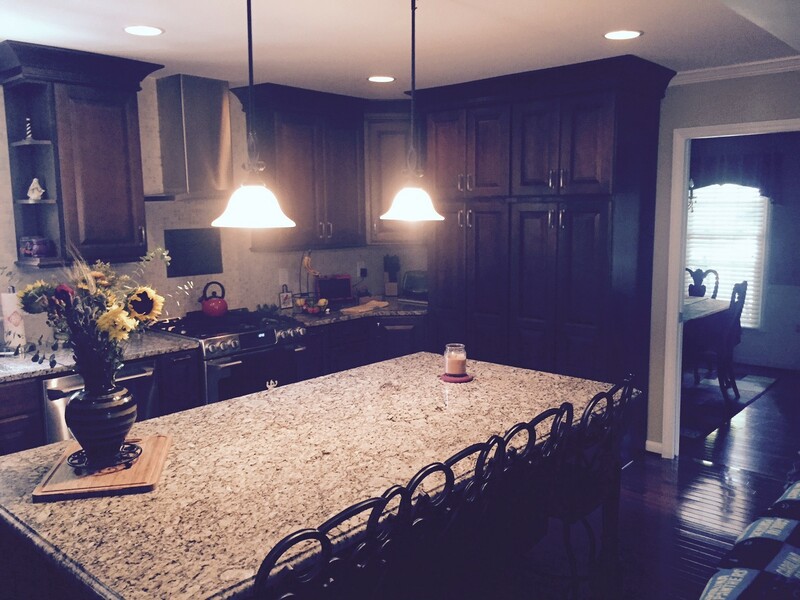 We can work with you to help you decide or we can work with your chosen pallet and materials to install every last detail of your kitchen remodel. In the kitchen above, the dark colored refaced cabinets are a perfect contrast to the light flecked granite countertop on the oversized kitchen bar. Indeed black is a very popular remodeling color. The “pop of red” is timeless but the “pop of black” provides that current look that tired old kitchens don’t have. It’s sleek, provides great contrast, is elegant and makes that statement. Can you imagine having a window seat in your Charlotte area kitchen? Imagine it. And then call Value Remodelers to make your dream a reality. Doesn’t the picture above just make you want to run to the store to pick out the perfect decorative throw pillows to mark this season? And then the perfect throw pillows to mark next season?